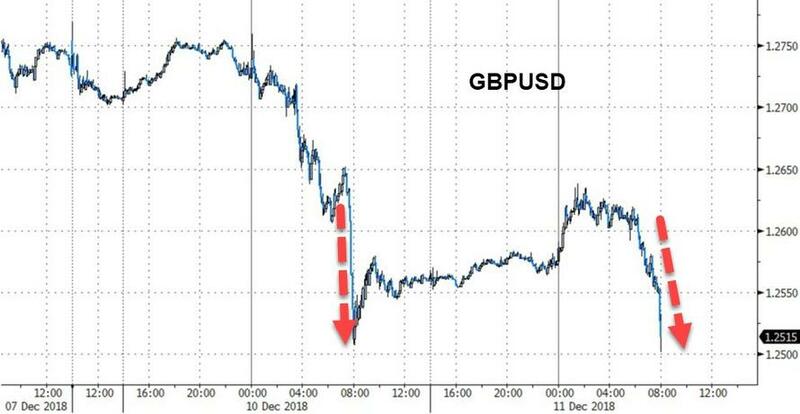 What looked like the first stirrings of a recovery in the pound Tuesday morning has given way to more selling, as the British currency tumbled to $1.2502 - just above a key psychological threshold - following reports that the conservatives' 1922 committee had finally received the 48 letters of no confidence necessary to trigger a vote of no confidence in Prime Minister Theresa May. The no confidence letter count stood at 46 as recently as Tuesday morning. However, a few frustrated remainers joined with their Brexiteer peers to push the total over the top. What's worse, the gesture of contempt comes as May is out of the country on a "whistlestop" our of European capitals in a desperate bid to achieve "assurances" on the Irish backstop that multiple EU leaders have said they wouldn't be willing to give. ...Which was followed by a wave of reports insisting that yes, the threshold has been reached. Here we go again. An ERG source writes: "They've reached 48 letters. Whitehall confirmed and someone in the chairman's office." And as fate would have it, this bout of internecine warfare among the Tories is brewing just as Labour is reportedly backing away from its plans to call for a no confidence vote in May's government.